When Paul Smith got his hands on the design icon that is the Anglepoise Type75 desk lamp, the result was always going to be striking—and spattered with clashing colors, it certainly is. 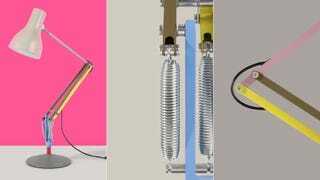 The special edition of the lamp uses Smith's trademark discordant color choices to pick out each element of the lamp's mechanical workings in a different hue. The grey, cast-iron base is complemented by blue, khaki and yellow stays, a pink neck and a cream lamp head.